One Hot Chocolate Melt is good for one cup of hot chocolate, which includes a salted mix of dark & milk chocolates molded onto a cinnamon stick which is used as it melts to stir. Making this is easy and doesn't require a huge amount of time, effort or special equipment. 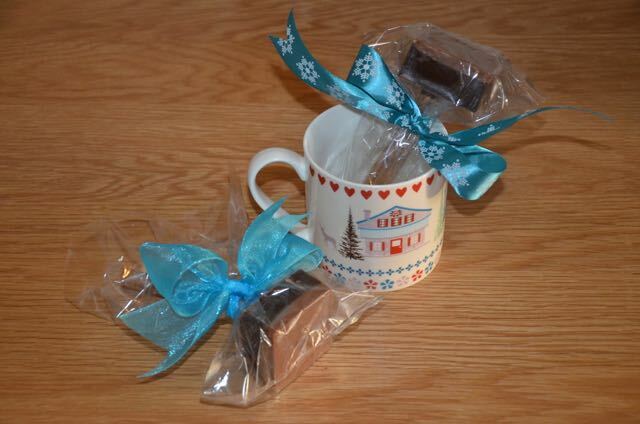 Whether wrapped up alone and stuffed into a stocking or wrapped up in a cute coffee mug, these are sure to be a hit with your favorite chocoholics! 1. Spray 4 molds or yoghurt pots with non-stick cooking spray and set aside. 2. Bring a pot of water to a simmer and melt the milk chocolate in a bowl resting on top, stirring occasionally. When it's completely melted, divide between the 4 molds and pop into the fridge for about 30 to 45 minutes to set. If you're using a silicone mold, it may be useful to put it on a baking tray or a cutting board so the molds don't move on the bottom. 3. When the milk chocolate has set, melt the dark chocolate the same way and again, when it's melted, divide it between the 4 molds, pouring it over the milk chocolate. 4. Sprinkle each mold with a bit of sea salt and insert a cinnamon stick. Fashion the cupcake cases around the sticks. They should be upside with the sticks coming through the middle hole so that they look a bit like a tent covering the chocolate molds. 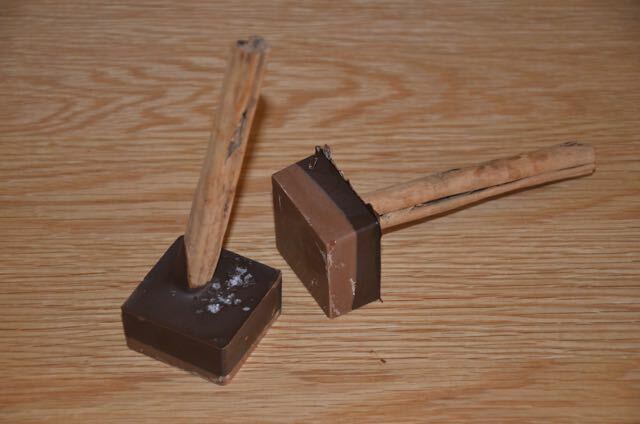 This will help the sticks to stand up while the chocolate sets. 5. Pop the molds into the fridge again, this time leaving until overnight. Carefully remove from the mold and throw away the cupcake cases. 6. 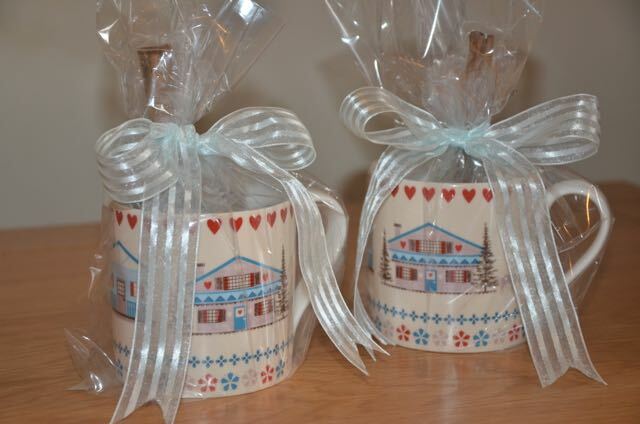 Wrap each Hot Chocolate Melt in cellophane or a clear treat bag and secure with a ribbon bow. 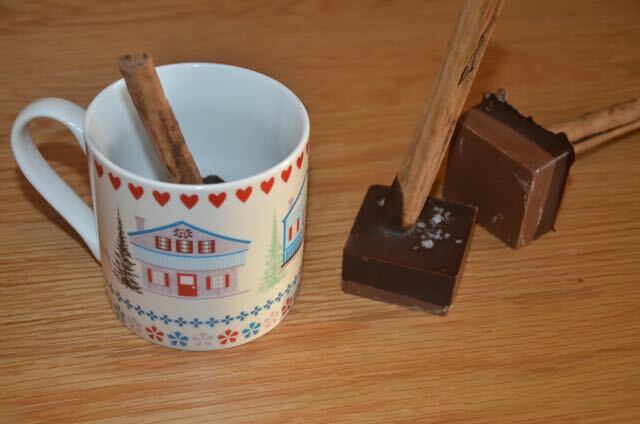 Melt into a steaming hot mug of milk and stir with the cinnamon stick to combine. Enjoy! 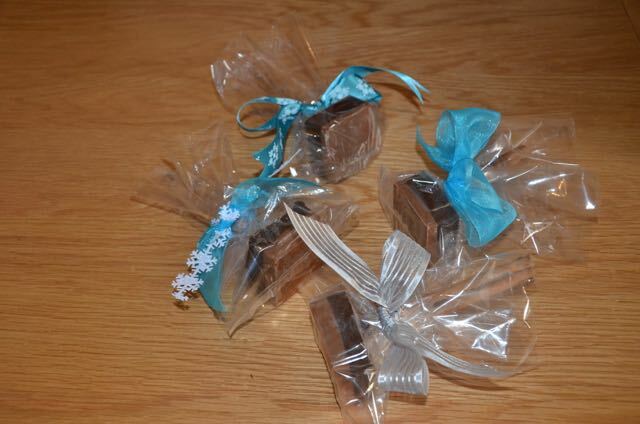 The Hot Chocolate Melts are great for stocking stuffers on their own, as an addition to a gift basket or attached to a present in lieu of a bow, however if you would like to make them into more of a gift, place one in a coffee mug and again, wrap the whole package in a clear treat bag or piece of cellophane, tied with a ribbon bow.